Sooooo because I had a poopy birthday this year, I’ve been doing a lot of online pony shopping. My dear sweet friend @Cactusflower sent me a surprise card and gift for my bday. I have a few other lots on their way to me as well. I also have a pony lot I nabbed from FB to pickup this weekend. So I will update with pictures with all them as they come in. BUT! I won my first EBay lot today in years. I can’t wait for him to come! He has a few flaws, but he has his hat and he’s been cleaned up nicely so I’m cool with the slight flaws he does have. I love my big brothers and I found this particular pony for a very good price, I couldn’t resist. I can’t wait! Sorry your bday was poopy. Gorgeous ponies. Sorry you had a sad birthday... but hooray for all the beautiful happy pony goodness! Happy belated birthday! Hopefully you can pick a second day to celebrate and that will be a happy one! Here's a late happy birthday to you! I'm so sorry I missed it! I'm glad you were able to find someone pony goodness. As promised, here’s the lot I grabbed from a seller on FB Marketplace today. I only got the lot because I spotted a So Soft Bangles and I had to have her. She needs a light bath and I need to figure out how to move her front leg so she can stand on her own again but her hair so soooooooooo silky and beautiful her symbols, paint and flocking is beautiful. 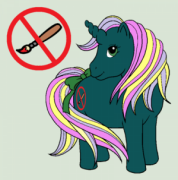 If I didn’t know better I would almost say this pony was a mib girl. I’m shocked at how beautiful she actually is. Then here’s the rest of the ladies I got with Bangles. I really like a few of these too, I might keep a couple. But I’m not sure... If anyone is interested in any please let me know! LOL, when life lets you down buy a pony! That's my motto too! Hopefully all this awesome pony goodness will make up for that poopy B-day! You got some beauties there! The Pony Gods have once again smiled upon me! I just snagged this from a seller on FB Marketplace!! I’m SO excited to get it home and set it up tomorrow!!! My first boxed “vintage” (makes me feel old as dirt when things I played with as a child are now considered vintage) pony item. Ooo what's that purple Pegasus pony with the dark hair? Sand dollar. She's a pretty one. @Leave a Whisper is the g3 guru. Here’s a couple of pictures of the G4/4.5 ponies I’ve snagged recently at various thrift stores. Some are for my collection, others will eventually end up on my sales page. I had an awesome day thrifting today!! 1) This beautiful Sweet Pocket. Now all I have to do is make a tulip and a bee for her. 4) CHEIF!! I love him so much even if he needs a lot of work. Now, sadly Cheif was SO rusty inside his body all my brushing was a waist of an hour. I had to cut it and will be re-rooting him. Then after poor Moondancer was in water there must be some kind of Something goopy in her hair. I just cut that away too. Fire Fly I plan on doing an alternate mane colour on. So here all three after a two hour bath and ready to be put in a jar for hydrogen peroxide soak for a few weeks. Hopefully marks come off all of them and I hope to also get Cheif more white with an Oxi soak.